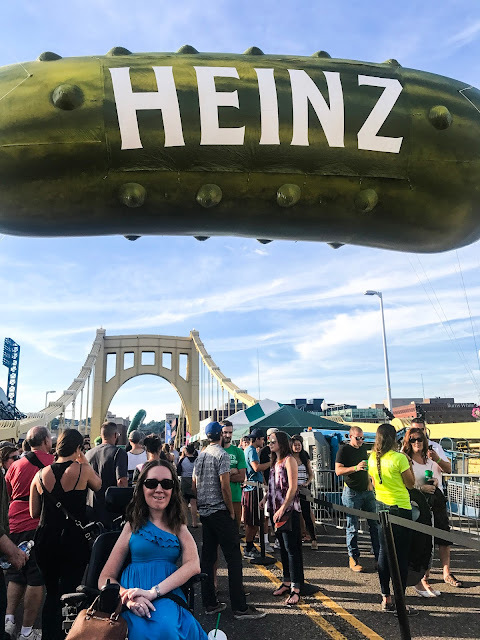 For the past few years, Pittsburgh has become Picklesburgh for one weekend each summer. We're a very proud city, and one of the companies that began here in Pittsburgh is Heinz, of ketchup and pickle fame. So for one weekend, the city shuts down one of the bridges, and people can walk through and find all sorts of pickle-related goodies. And I really do mean all sorts! There were pickles on a stick, pickle flavored cocktails, pickle eating contests, pickling demos, and even pickle funnel cake! There were also live bands playing all weekend, free Heinz pickle pins, and a meet-and-greet with a pickle character himself. Because it rained here on Friday, Saturday was an incredibly busy day at Picklesburgh. As much as I would have loved to try some of the pickle-flavored foods, the lines for each booth were 30 plus minutes long. It took at least 15 minutes just to walk from one end of the bridge to the other because of the crowds. 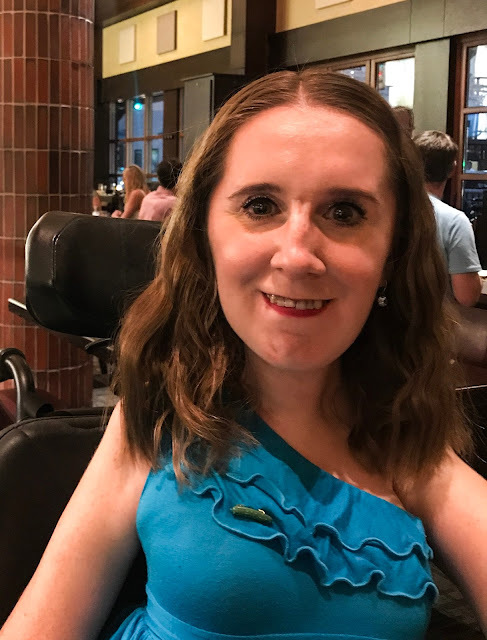 I'm not someone who panics in crowds, but it was just too overwhelming, and honestly, too hard to deal with navigating my wheelchair in and out of the crowds and the lines. I was also slightly annoyed going into it, because on my walk from parking to the bridge, there was some scaffolding that completely blocked wheelchair access to the ramp and sidewalk. This meant that I - along with anyone using a stroller - had to walk in the bike lane, directly on the road. This is do-able in the middle of the day on a Saturday when the bridge is closed, but incredibly dangerous during rush hour on a work day! The scaffolding only needed to be moved slightly to allow enough room for me to get through, but it's an example of something I run into all the time - people just not thinking about the needs of others. Back to Picklesburgh -after checking out the booths, and realizing I didn't have patience for any of the lines, I ended up at Six Penn, one of my favorite restaurants in the whole city. Sadly, the rooftop was too crowded, but I had a delicious meal inside, and made sure to wear my pickle pin to bring a little bit of Picklesburgh with me!